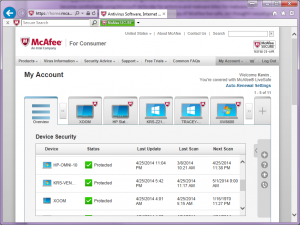 McAfee LiveSafe has continued to perform exceptionally well. Of the six computers that I am running it on none have exhibited any issues. LiveSafe has not caused any slowdown or lock up or application issues. I’m still extremely pleased with the product. I have also deployed it on several android tablets. I have noticed that it does slow down older tablets. Also, I’m not sure that there is a clear benefit to running it on tablets. Although it does a very good job of screening applications to make sure applications are clean before installing them and it gives the ability to reset a tablet remotely should your tablet be lost or stolen. One thing I should note is I also run MalwareBytes for anti-malware protection. I find that regardless of whose antivirus you are running it is still a very good idea to run some form of anti-malware protection. I find MalwareBytes to be the best in my opinion. If you have a child that plays MineCraft, you have a malware problem. 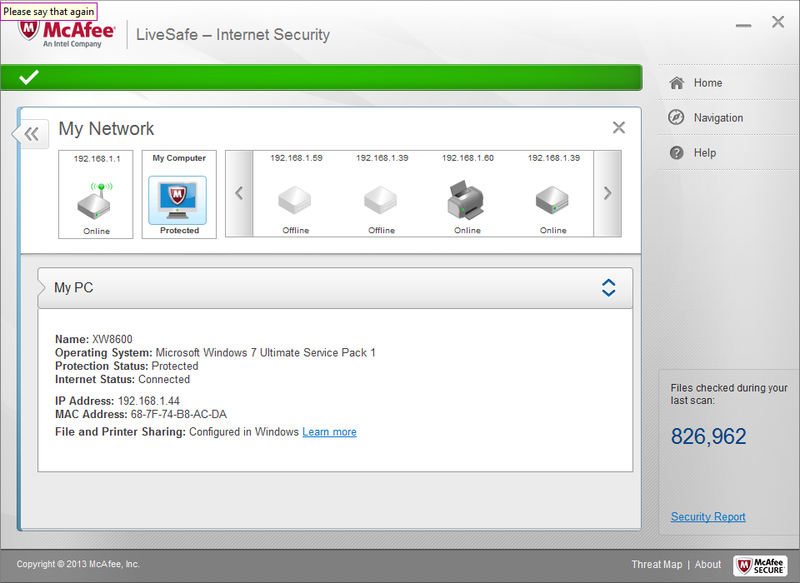 For me the combination of running McAfee LiveSafe for antivirus protection and MalwareBytes for anti-malware protection has kept all the PCs in my house free of viruses and malware. Back on Black Friday, I noticed Office Depot was still giving away a free copy of McAfee LiveSafe with the purchase of any computing device including their least expensive tablets. I’m not sure how long that offer lasts, but if you’re buying a tablet or computer the free add-on of LiveSafe is a very good deal. 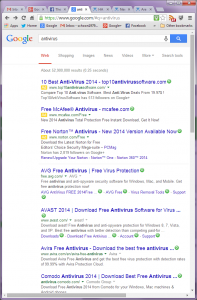 Through 2013 antivirus became a topic of discussion again. Most of us had settled in using Microsoft Defender and had been having good luck with it. It came to light that Defender did not fare well in antivirus testing. I had become comfortable using Microsoft Defender for antivirus and Malwarebytes for malware. 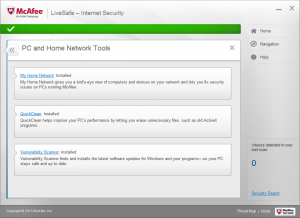 In December while purchasing a tablet I was given a free copy of McAfee LiveSafe, so I thought I would give it a try. Retail for live safe is $79.99, but I have seen it for as low as $39.99. 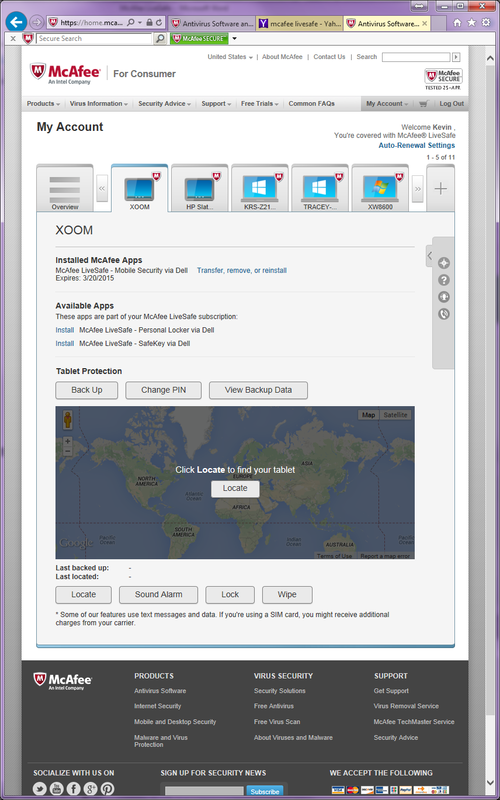 It can be used on all PCs and Android and iOS tablets in your household. You log into your McAfee account load your license key and then you are able to deploy the software solution. 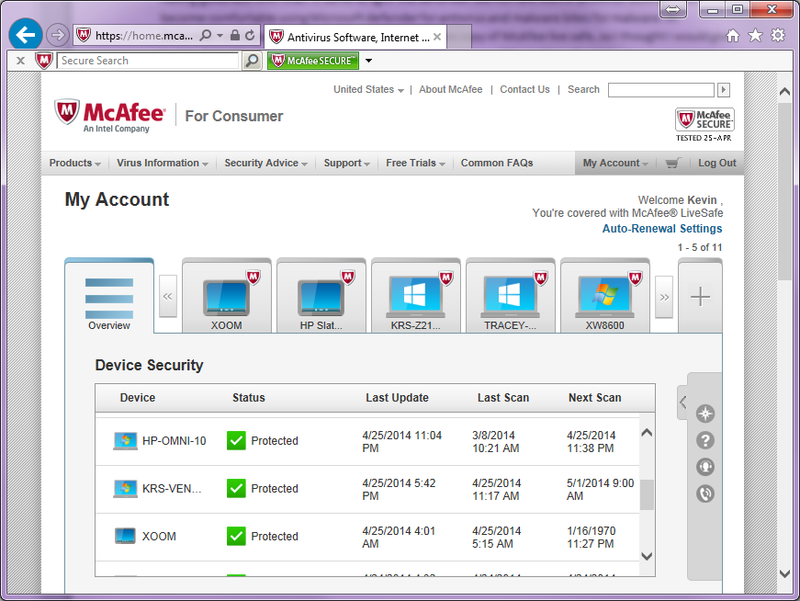 Oddly, the last time I had used McAfee was in 2005 and that key was still showing in my account. Currently I have it running on Windows 7 PCs, Windows 8 PCs, Windows 8 tablets and Android tablets. In the past the main issue I’ve had with antivirus products is the performance hit they give to the system they are loaded. Incompatibility, crashing and locking up are other issues I have experienced them causing. 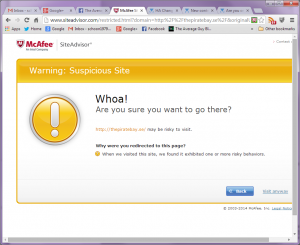 I have seen none of that so far with McAfee LiveSafe. Oddly, on one of the new PCs have been working on, it came with a copy of Norton preloaded and Norton was giving me some issues around network performance and security. 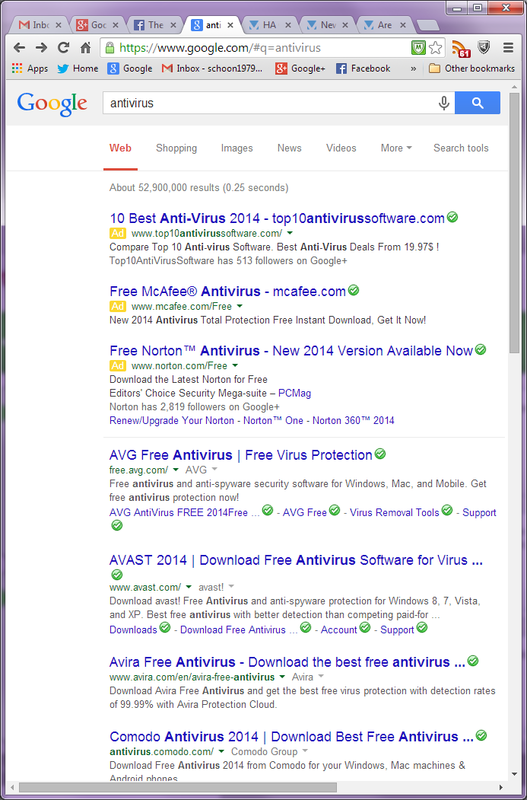 Once I uninstalled Norton and installed McAfee all of these issues have gone away. 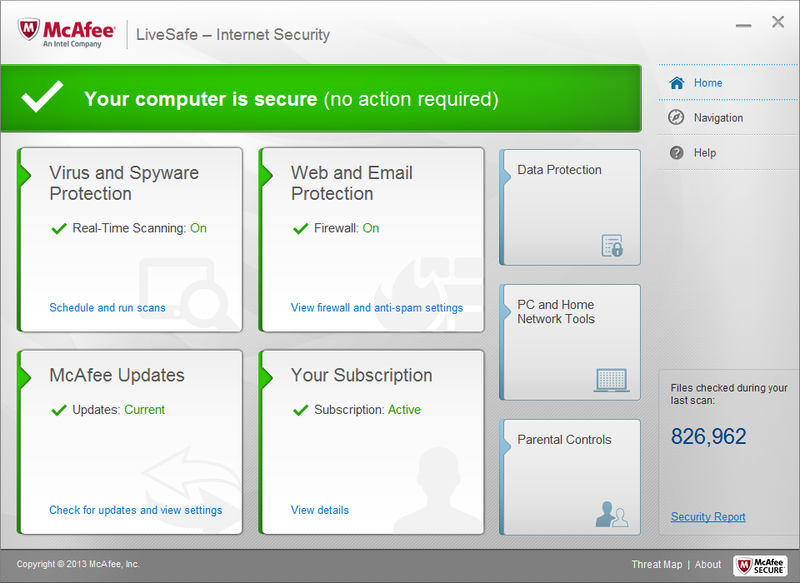 The management interface for McAfee LiveSafe is very clean, showing virus and spyware protection, web and e-mail protection, update and subscription status. Additionally there are parental controls that can be used, I’m still in the process of testing those. There is Safe Key, password management that’s able to be deployed and there is a 1 GB encrypted cloud storage area available as well called Personal Locker. 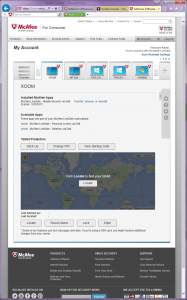 Some other handy tools built-in is My Home Network which gives you a view of your network and also alerts you when devices are added to your network or come online to your network. There’s a vulnerability scanner that searches for software updates for Windows and many other programs on your PC. There’s a function called Quick Clean which helps improve PC performance by clearing unnecessary files and old active X programs. Under data protection there is a file shredder program as well. 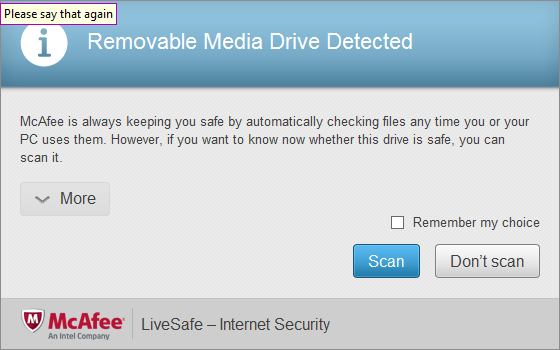 Another nice thing for family PC is that McAfee instantly pops up to scan USB drives when they are plugged in. 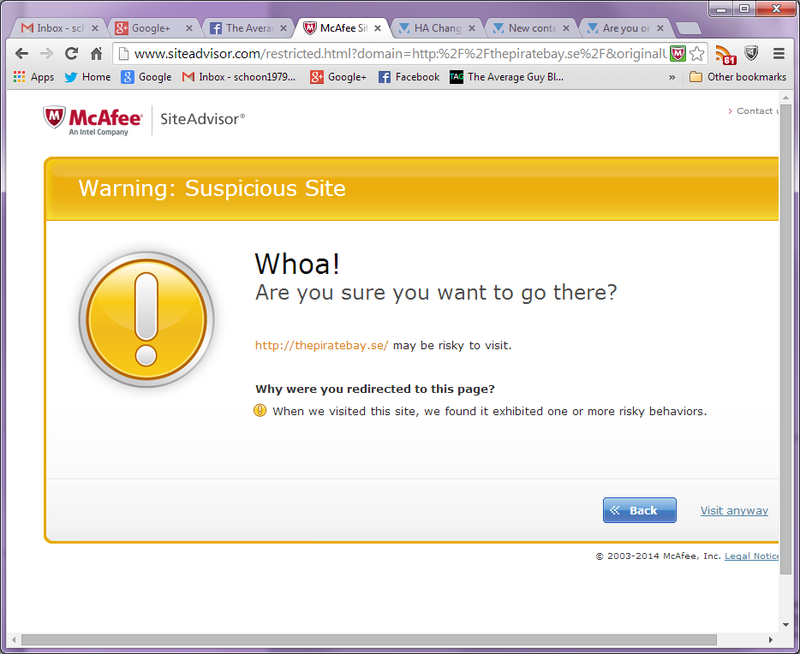 I like the web filtering feature, going to suspicious sites will cause McAfee to ask you if you really want to go there. Site advisor seems to do very good job of analyzing and checking sites during a web search advising me who are ads and who are legit trusted sites. These are shown by the green check marks are the yellow ad boxes. I was initially concerned about the android virus scanning function as being perhaps too much of a load for a tablet but much like the PC-based products I’ve really seen no issue with the performance of the tablet while running the antivirus and Web filtering functions. On my android tablets from the web-based console I can view the data backed up from them, I can locate the tablet or in case it’s lost I can wipe the data from the tablet. My own little Mobile Device Manager. This is a very preliminary first review of the product but I’m very impressed so far. None of the concerns I’ve had in the past with performance hit or instability have arisen. It’s an assumption on my part but I have to believe the influence of Intel owning McAfee is starting to pay off. I’m impressed with the feature set of the manageability for Android tablets and would like to see if the same locate, backup and wipe functions could be available for Windows tablets. There should be a process to tell the app that even though it’s Windows 8 it’s actually a tablet device. 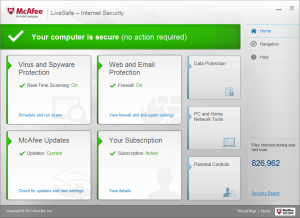 So far I am very satisfied with McAfee LiveSafe. The newest version of AVG ruined my install on Windows8 and Windows10. In sizing the graphics they got a bit fuzzy, but if you click on a graphic it will open in its own window and be very clear. Kevin, one of the things I never liked about McAfee or Norton, was the fact they were heavy and resource intensive. Looks like maybe they have addressed that for mobile devices?